This weekend’s dinner was a huge success! There is nothing like spending a Saturday night hobnobbing with celebrities (and by hobnobbing, I mean standing next to and staring at celebrities). First things first, the outfit. After much hemming and hawing, I opted to wear a dress I already owned. 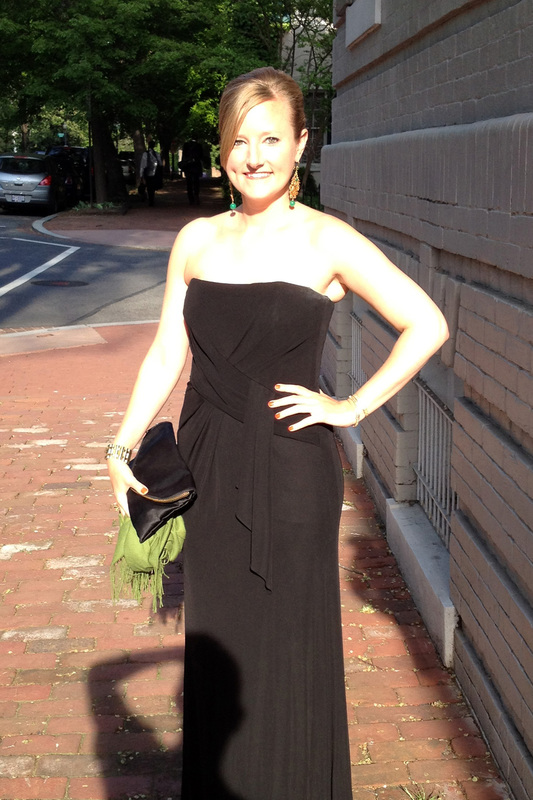 I tried to get this dress from Rent the Runway, but I couldn’t get it in time for the dinner. I looked at other options, but the ones the I liked were all well over $200 to rent. As we know, I had a $150 budget for the dinner so that wasn’t going to work. I decided to spend my budget on primping instead. I got a mani pedi at my favorite nail place, Vicky’s, and then hit VSL for my up do (thanks to my fairy godmother). Here is the final result (photos courtesy of my fabulous and patient neighbor). You might recognize the earrings from an eBay oops earlier this year. The hair was ok. I always have high hopes that it will look different when I get it done, but it always ends up looking the same. In the back was a simple bun – no photo needed. I wanted to do something easy since I was going to a cheaper place. I will say that she did a nice job, and I was happy with my $58 spent. I think next time I need to put more thought into what I want and maybe I’ll get that spectacular look I was hoping for. The party, on the other hand, did not disappoint. I get sheepish about approaching celebrities for pictures, so I don’t have a ton of those. 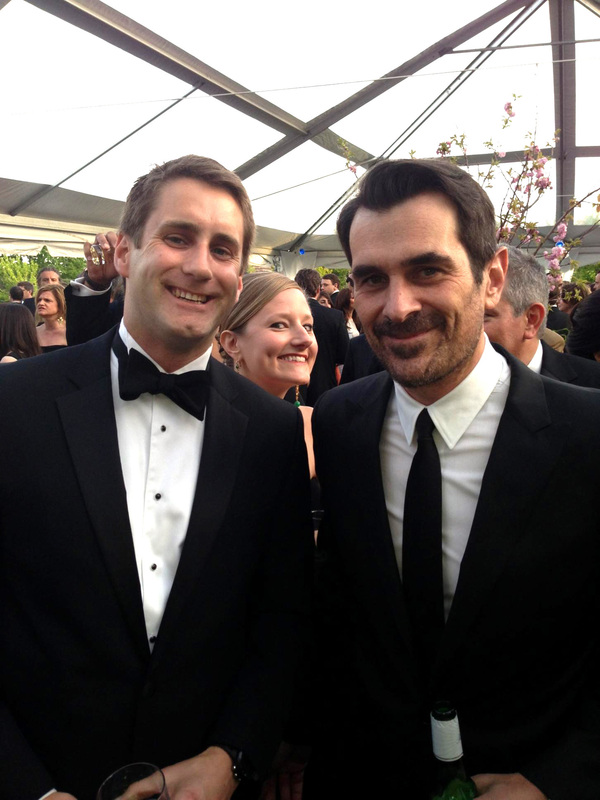 I did manage a spectacular photo bomb in my friend Kyle’s picture with Ty Burrell at the ABC party. When I realized what was happening, I knew I had 2 choices – duck or embrace the moment. Clearly, I embraced. Amazing right? Something about movies stars turns me into a total nut. Sigh. At one point during a mid-dinner ladies room run, I found myself sharing the bathroom with Amy Poehler, Olivia Wilde, and Morena Baccarin from Homeland. I couldn’t bring myself to ask for a picture in the ladies room, so I just I washed my hands for a very long time and then left when I was on the verge of being a real creep. Not too shabby for a star-studded evening if I do say so myself! What do you think? And you loooked AMAZING!!! The other dress was nice but yours was the right call. Elegant, classic and superb on you. Well done Discountess! So jealous of your evening – and your style and budget is off the chart!